We provide various types of swing and sliding gates; both manual and automated, which can be installed to meet all your security, industrial or domestic needs. Our comprehensive choice of designs, finishes and features, ensures we have the exact product and bespoke service to suit your requirements. 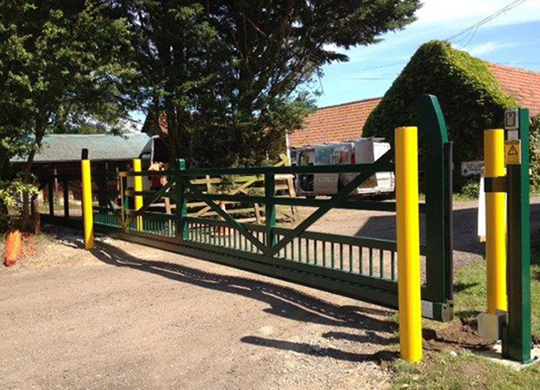 All of our gates can be made to measure and can be fitted to existing posts or can be fitted with new posts of various sizes and thickness to suit. Whether your site demands a grand entrance to enhance its surroundings, or the provision of high security is your top priority, Countrywide Fencing can help you assess your requirements and meet your exacting specifications. Single or double swing gates can be made to your exact specifications, from small commercial driveways, to large commercial vehicle gates. Sliding gates provide a practical solution for areas where there may be insufficient room for swing gates to open. These can span a range of opening widths and offer a high level of security. Our gate range spans a huge variety of styles, finishes and materials. We offer a complete gate automation package for all of our semi and fully automatic operations. All ground works, fitting and installation and electrics are inclusive. All electrical work is carried out by a registered electrician and a completion certification is provided. All gates adhere strictly to current British standards and safety regulations.